In accordance with the Shinto practice of ritual purification known as misogi, the shin-otoko (holy men) and the two teams of local men cleanse themselves of their sins and impurities by washing in the sea. Two local 25-year-old men – one from Kanchi and one from Fukuchi – are selected to participate in the festival as shin-otoko, or holy men. Being selected as a shin-otoko is considered a great honour, as it is believed that shin-otoko bring good fortune on themselves and others. The costumes worn by Toba-dai-kagaribi festival participants are made from the thick cotton banners of previous festivals. Because of the catlike appearance of their hoods, the men are often referred to as neko (cats) by local townspeople. With prayer rites finished and offerings for a good harvest made, torches are used to light the giant towers while the two teams wait in anticipation. The hunt for the holy trees begins as a group of four teammates attempt to destabilise the structure of the suzumi by shaking it vigorously. In an impressive display of courage and teamwork, the men tear at the towering inferno, forcing it apart and weakening its structure. When the heat and smoke becomes too much to bare, the men are forced to jump from their ladders. Two men are able to tear off a portion of the suzumi. With flames lapping at their faces, the men hurriedly attempt to dismantle the burning bamboo frame of the suzumi. One man is able to partially weaken the suzumi by breaking its bamboo frame with his hands. After each attempt at the suzumi, the men are splashed with water before repeating the process. The air becomes thick with smoke as the structure of the suzumi weakens. With bundles of burning grass falling on their heads and smoke billowing in their faces, the men violently shake the burning suzumi. Though visibly exhausted by the task at hand, the men continue to shake and tear at the towers. As a large portion of the suzumi collapses, a wall of flames and smoke surrounds one man. With his costume on fire, one man is forced to jump from the burning suzumi. With the structure of the suzumi compromised, the men are able to use their combined weight and strength to pull it over. As the suzumi topples onto its side, an enormous wall of fire engulfs the men. The men pull the burning remains of the holy tree from the suzumi. The men remove their masks to reveal faces fatigued by the immense physical effort of the task. Where the towers once stood, now only fire remains. Once the holy trees have been retrieved, they are taken to the Toba-Shinmeisha-shrine as an offering. Following the event, the shin-otoko are interviewed by teams of local camera crews on the steps of the Toba-Shinmeisha-shrine. 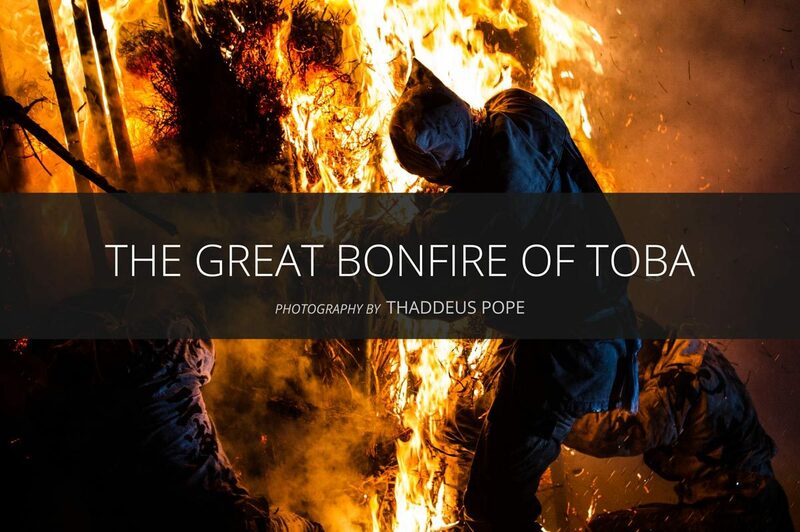 One of the most extraordinary festivals in Japan, Toba Dai Kagaribi (The Great Bonfire of Toba) is a designated National Intangible Folk Cultural Property with roots that can be traced back 1,200 years. The purpose of the festival, which takes place in February at the shrine of Toba Shinmeisha near the city of Nishio in the Chūbu region of Honshū, is to forecast the weather and harvest of the coming year by way of a highly ritualised and potentially dangerous competition between two teams of local men – one from the east side of the Toba River and one from the west. The east is known as Kanchi or “Dry Land” and the west is known as Fukuchi or “Prosperous Land”. The festival incorporates a commonly held belief in Japan that certain years in a person’s lifetime are inauspicious. These years are known as your yakudoshi – unlucky years. Your unlucky years are 19, 33 and 37 if you are female, and 25, 42 and 61 if you are male. In acknowledgment of the potential danger and misfortune that might befall a person during these years, many Japanese people choose to undergo a ritual purification in the middle of a yakudoshi year, and will often visit temples and shrines to pray for better luck. In the example of Toba Dai Kagaribi, two local 25-year-old men (one from Kanchi and one from Fukuchi) are selected to participate in the festival as shin-otoko, or “holy men”. Being selected as a shin-otoko is considered a great honour, as it is believed that shin-otoko bring good fortune on themselves and others. With an outer frame made from 60 bamboo poles tied tightly together, and a core filled with huge bundles of sun-dried Japanese pampas grass, each of these highly flammable towers stands approximately 5 metres tall and weighs more than 2 tons. On the eve of the festival, in keeping with a centuries-old tradition, two enormous torches, known as suzumi, are built at Toba Shinmeisha. A sacred tree is placed at the centre of each suzumi during its construction and 12 ropes representing the 12 months of the year are wrapped around its base. With an outer frame made from 60 bamboo poles tied tightly together, and a core filled with huge bundles of sun-dried Japanese pampas grass, each of these highly flammable towers stands approximately 5 metres tall and weighs more than 2 tons. The following day, in accordance with the Shinto practice of ritual purification known as misogi, the shin-otoko and the two teams of local men cleanse themselves of their sins and impurities by washing thoroughly in the sea nearby. Once the ritual of misogi is complete, the men make their way to the shrine of Toba Shinmeisha where they present tamagushi (a form of Shinto offering) and receiving blessings. Later that evening both teams emerge from the shrine wearing traditional festival costumes and head towards the suzumi where further offerings are made for a good harvest. Shortly thereafter, the suzumi are set alight and the teams begin to compete to see which of them can remove the sacred tree and 12 ropes from the burning towers fastest. This difficult task is made all the more challenging by the fact that it must be accomplished by hand, with minimal protection from the intense heat and smoke produced by the massive bonfires. Once removed from the suzumi, the remains of the sacred tree and the 12 ropes are brought to Toba Shinmeisha by the winning team as an offering. The condition of these salvaged objects is then used to foresee the weather and the quality of the harvest for the coming year.